Suzuki Shônen was born in Kyoto as son of Suzuki Hyakunen (1825-1891) who established his own style of painting without adhering to any of the established styles such as the Shijô-Maruyama, nanga or Kanô schools. Shônen is considered the best student of Hyakunen's, and was known for his bold and dramatic brushstrokes. From 1881 to 1888 Shônen was the head of the Northern Division (ink painting in the Sesshû tradition) of the Kyoto Prefecture Painting School (other divisions were: South - nanga school; East - Shijô-Maruyama school; and West - Western style painting). Shônen appears to have been satisfied with cultivating his own art on the eve of sweeping modernisation in Japanese painting, which, in Kyoto, was led by Takeuchi Seihô, a pupil of Shônen's rival and a Shijô artist Kôno Bairei. Thus his name is less often associated with the modern movements of Japanese painting than with Uemura Shôen, one of his most talented students and the most prominent female painter of the Meiji period. 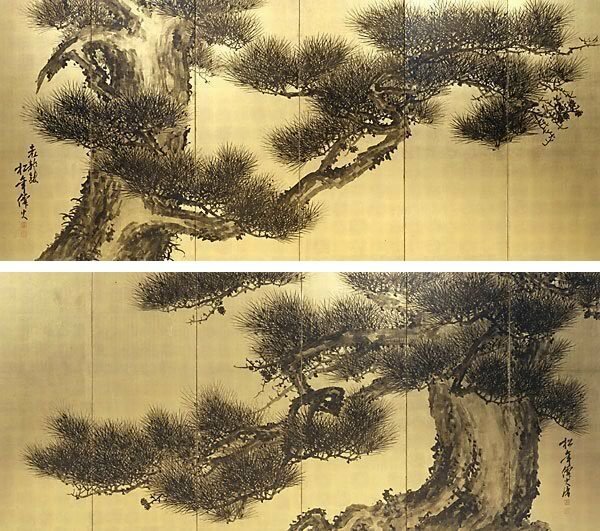 Shônen is known for his powerful brushstrokes, as demonstrated in this spectacular pair of screens, on which he depicted the pine tree, a symbol of strength, with the unfettered spirit of the progressive Meiji era. Asian Art Dept, AGNSW, February 2000. Signed l.r. of right screen in Japanese, stamped in red ink, "[two artist's seals]". Not dated. Signed l.l. of left screen in Japanese, stamped in red ink, "[two artist's seals]". Not dated.